Within Config manager the client is within the "All Systems" collection however, under the column 'Client' the answer is NO. First thing to do is click on "Client installation methods" located under Site Settings. Then right click on "Client Push Installation" and select properties. On the general tab if you click on "Enable Client Push Installation to assigned resources" any system discovered throug AD (or other) will have a client automatically installed. Depending on you environment consider this tick box. On the Accounts tab you must input account credentials that will have administrative access to the admin$ share of the client system. The account that can access desktops may be different to domain controllers so you can put multiple accounts in here and it will try them in order. Client agents under Site Settings will list the agents that will be pushed out with the SCCM client. The computer client agent is critical. On the properties tab is important you have set a Network access account. This agent will connect back to the SCCM server looking installation folders so it must have suitable access delegated. Now SCCM is configure correctly and agents have the appropriate account setup for connection. Right click the system without the client, Then "Install Client". This will bring up a wizard, i like to select include only clients in this site's boundaries and Always install (repair ...). Finish the wizard. 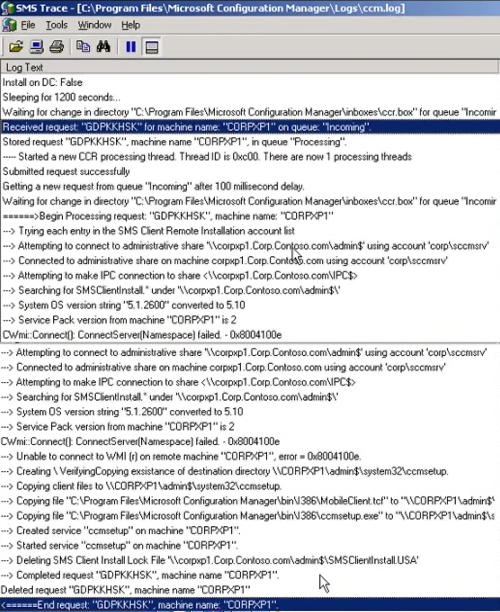 Using Trace32 open the CCM log on the SCCM server. Which will show the client deployment process so we can see if it is succeeding. "Clientlocation.log" confirm the current management point is correct. "Execmgr.log" This log reads policy from the management point. So advertisements creates a policy which the client reads . "Software distribution agent was enabled" will not be in red. Within the control panel there will now be three additional icons. The Configuration Manager, Run Advertised Programs, Remote control Properties, and Program Download monitor. There are two services installed on the client system.